A Derbyshire MP could see his name on road signs and in an atlas with the prospect of a new junction on the M1 being named after him. 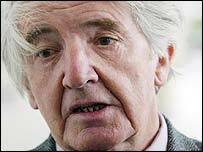 Dennis Skinner, 72, is credited with work behind the planned 29A junction. Roads minister David Jamieson is suggesting the name of Skinner's Junction in tribute to the Bolsover MP. Skinner Junction would join Belisha beacons, bobbies on the beat, Big Ben, and a ship's Plimsoll line which all have their origins in the names of MPs. The ex-miner has been at the forefront of a campaign to use former pit land in his constituency for a business park to replace thousands of jobs lost when the mines were closed. Mr Skinner, a miner for 21 years before taking his seat in the Commons in 1970, saw five years' defiance of sceptics bear fruit this week when the road project got the go ahead. The man who was once thrown out of the Commons for calling Tory mine closures "crooked" has been celebrating the road project in the east Midlands. He said: "Junction 29A - I've campaigned to release all that land which will create 5,000 jobs for those ex-miners and others... it will go ahead." Mr Jamieson told the Commons: "I will give careful consideration to the naming of this junction to call it Skinner's Junction"
The M1: Many happy returns?